I'm Zack, and this is my blog. Have a look at the most recent posts below, or browse the tag cloud here on the right. Archives are available as well. You can leave comments on my posts by following the relevant link associated to each post. You can also mail me comments; note that unless otherwise requested, I will add mailed comments in the comment feeds. The blog is mostly in English with some posts in Italian and French here and there. Non-profits that provide project support have proven themselves to be necessary for the success and advancement of individual projects and Free Software as a whole. The Free Software Foundation (founded in 1985) serves as a home to GNU projects and a canonical list of Free Software licenses. The Open Source Initiative came about in 1998, maintaining the Open Source Definition, based on the Debian Free Software Guidelines, with affiliate members including Debian, Mozilla, and the Wikimedia Foundation. Software in the Public Interest (SPI) was created in the late 90s largely to act as a fiscal sponsor for projects like Debian, enabling it to do things like accept donations and handle other financial transactions. More recently (2006), the Software Freedom Conservancy was formed. Among other activities—like serving as a fiscal sponsor, infrastructure provider, and support organization for a number of free software projects including Git, Outreachy, and the Debian Copyright Aggregation Project—they protect user freedom via copyleft compliance and GPL enforcement work. Without a willingness to act when licenses are violated, copyleft has no power. Through communication, collaboration, and—only as last resort—litigation, the Conservancy helps everyone who uses a freedom respecting license. The Conservancy has been aggressively fundraising in order to not just continue its current operations, but expand their work, staff, and efforts. They recently launched a donation matching campaign thanks to the generosity and dedication of an anonymous donor. Everyone who joins the Conservancy as a annual Supporter by February 28th will have their donation matched. A number of us are already supporters, and hope you will join us in supporting the world of an organization that supports us. Last Saturday at FOSDEM we have opened up the public API of Software Heritage, allowing to programmatically browse its archive. We posted this while I was keynoting with Roberto at FOSDEM 2017, to discuss the role Software Heritage plays in preserving the Free Software commons. To accompany the talk we released our first public API, which allows to navigate the entire content of the Software Heritage archive as a graph of connected development objects (e.g., blobs, directories, commits, releases, etc.). Over the past months we have been busy working on getting source code (with full development history) into the archive, to minimize the risk that important bits of Free/Open Sources Software that are publicly available today disappear forever from the net, due to whatever reason --- crashes, black hat hacking, business decisions, you name it. As a result, our archive is already one of the largest collections of source code in existence, spanning a GitHub mirror, injections of important Free Software collections such as Debian and GNU, and an ongoing import of all Google Code and Gitorious repositories. Up to now, however, the archive was deposit-only. There was no way for the public to access its content. While there is a lot of value in archival per se, our mission is to Collect, Preserve, and Share all the material we collect with everybody. Plus, we totally get that a deposit-only library is much less exciting than a store-and-retrieve one! Last Saturday we took a first important step towards providing full access to the content of our archive: we released version 1 of our public API, which allows to navigate the Software Heritage archive programmatically. You can have a look at the API documentation for full details about how it works. But to briefly recap: conceptually, our archive is a giant Merkle DAG connecting together all development-related objects we encounter while crawling public VCS repositories, source code releases, and GNU/Linux distribution packages. Examples of the objects we store are: file contents, directories, commits, releases; as well as their metadata, such as: log messages, author information, permission bits, etc. The API we have just released allows to pointwise navigate this huge graph. Using the API you can lookup individual objects by their IDs, retrieve their metadata, and jump from one object to another following links --- e.g., from a commit to the corresponding directory or parent commits, from a release to the annotated commit, etc. Additionally, you can retrieve crawling-related information, such as the software origins we track (usually as VCS clone/checkout URLs), and the full list of visits we have done on any known software origin. This allows, for instance, to know when we took snapshots of a Git repository you care about and, for each visit, where each branch of the repo was pointing to at that time. Our resources for offering the API as a public service are still quite limited. This is the reason why you will encounter a couple of limitations. First, no download of the actual content of files we have stored is possible yet --- you can retrieve all content-related metadata (e.g., checksums, detected file types and languages, etc. ), but not the actual content as a byte sequence. Second, some pretty severe rate limits apply; API access is entirely anonymous and users are identified by their IP address, each "user" will be able to do a little bit more than 100 requests/hour. This is to keep our infrastructure sane while we grow in capacity and focus our attention to developing other archive features. If you're interested in having rate limits lifted for a specific use case or experiment, please contact us and we will see what we can do to help. If you'd like to contribute to increase our resource pool, have a look at our sponsorship program! About 3 weeks ago, together with Molly and Mathieu, we launched the first edition of the Debian Contributors Survey. I won't harp on it any further, because you can find all relevant information about it on the Debian blog or as part of the original announcement. But it's worth noting that you've now only one week left to participate if you want to: the deadline for participation is 4 December 2016, at 23:59 UTC. If you're a Debian contributor and would like to participate, just go to the survey participation page and fill in! Il referendum costituzionale è alle porte, ma di questo certamente vi eravate già accorti. Nel mio piccolo, e con un gruppo di amici, abbiamo provato a dare un contributo al tanto sbandierato (ma poco applicato...) mantra della discussione sul merito della riforma. A tal fine abbiamo prodotto una versione della riforma costituzionale che mostra parola per parola cosa cambierebbe in caso di approvazione definitiva della riforma. Nel gergo di noii geek, questo è un word diff della riforma costituzionale. Il progetto più generale di cui quella pagina è parte si chiama Sane e robuste Costituzioni. 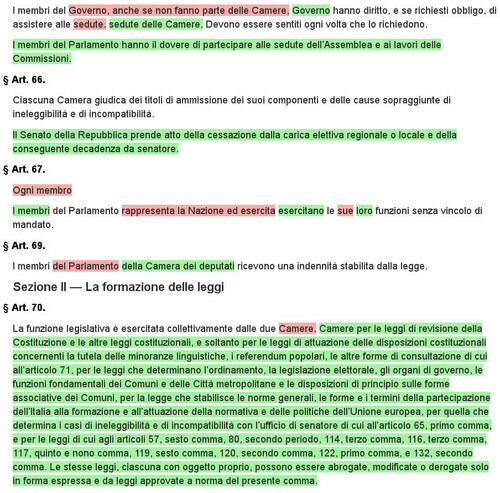 Contiene varie versioni della Costituzione della Repubblica Italiana in formato Markdown, e meccanismi per generare automaticamente resoconti sintetici delle differenze fra di loro. Se siete sviluppatori e volete contribuire, potete farlo su GitHub. As part of my master class on Free and Open Source (FOSS) Software at University Paris Diderot, I invite guest lecturers to present to my students the point of views of various actors of the FOSS ecosystem --- companies, non-profits, activists, lawyers, etc. Tomorrow, Tuesday 2 February 2016, the students will have the pleasure to have as guest lecturer John Sullivan, Executive Director of the Free Software Foundation, talking about Overthrowing the tyranny of software: Why (and how) free societies respect computer user freedom. The lecture is open to everyone interested, but registration is recommended. Logistic and registration information, as well as the lecture abstract in both English and French is reported below. The lecture will be in English and open to everyone, but registration is recommended at https://framadate.org/iPqfjNTz2535F8u4 or via email writing to zack@pps.univ-paris-diderot.fr. Anyone who has used a computer for long has at least sometimes felt like a helpless subject under the tyrant of software, screaming (uselessly) in frustration at the screen to try and get the desired results. But with driverless cars, appliances which eavesdrop on conversations in our homes, mobile devices that transmit our location when we are out and about, and computers with unexpected hidden "features", our inability to control the software supposedly in our possession has become a much more serious problem than the superficial blue-screen-of-death irritations of the past. Software which is free "as in freedom" allows anyone who has it to inspect the code and even modify it -- or ask someone trained in the dark arts of computer programming to do it for them -- so that undesirable behaviors can be removed or defused. This characteristic, applied to all software, should be a major part of foundation of free societies moving forward. To get there, we'll need individual developers, nonprofit organizations, governments, and companies all working together -- with the first two groups leading the way. Le cours (en langue Anglaise) sera ouvert à toutes et à tous, mais l'inscription est recommandé via le formulaire https://framadate.org/iPqfjNTz2535F8u4 ou par mail à l'adresse zack@pps.univ-paris-diderot.fr. Chacun de nous, au moins une fois dans sa vie, a pesté contre son ordinateur dans l'espoir (vain) d'obtenir un résultat attendu, se sentant dépossède par un tyran logiciel. Mais au jour d'aujourd'hui - avec des voitures autonomes, des dispositifs "intelligents" que nous écoutent chez nous, des portables qui transmettent notre position quand nous nous baladons, et des ordinateurs pleins des fonctionnalités cachées - notre incapacité de contrôler nos biens devient une question beaucoup plus sérieuse par rapport a l'irritation qu'auparavant nous causait l'écran bleu de la mort. Le logiciel libre permet à chaque utilisateur d'étudier son fonctionnement et de le modifier --- ou de demander à des experts dans la magie noire de la programmation de le faire a sa place --- supprimant, ou du moins réduisant, les comportements indésirés du logiciel. Cette caractéristique du logiciel libre devrait être appliquée à chaque type de logiciel et devrait constituer un pilier des sociétés se prétendant libres. Pour achever cet idéal, développeurs, organisations à but non lucratif, gouvernements et entreprises doivent travailler ensemble. Et les développeurs et les ONG doivent se positionner au premier rang dans ce combat. As announced last year, starting January 2015 I've benefited from a "Flash Grant" kindly awarded to me by the Shuttleworth Foundation. This post reports publicly about how I've used the money to promote Free Software via my own activism, over the period January-December 2015. I'm lucky to have a full-time academic job that provides me with a salary and basic computer hardware. But Free Software not being the only focus of my job, it gets difficult at times to get travel funding to specific Free Software events. So that is what I've mostly used the grant money for: attend Free Software events that I wouldn't have been able to attend otherwise. On grant money I've attended LibrePlanet 2015 (2015-03-19-boston-libreplanet label in the financial reports below), where I've given the talk Distributions and the Free "Cloud", and FSFE's LLW 2015 (2015-04-15-barcelona-fsfe-legal) workshop. Furthermore I've used the grant to reimburse otherwise not reimbursed out of pocket expenses in a trip to San Francisco (2015-11-06-san-francisco-gsoc+osi) that have been otherwise sponsored by Google (to attend the Summer of Code Mentor Summit) and OSI (to attend a F2F meeting of the Board of Directors). Finally, I've used grant money to offer lunch to invited lecturers in my master-level Free Software class at the university (label 2015-foss-class). Actual financial reports are reported below, in ledger format. It should be noted that, contrary to the usual expected 6-month duration of flash grants, I've used only about half the grant amount over a 12-month period; I do not plan to pocket what remains, but rather keep on using it over the next year, reporting again publicly at the end of the period. Also, I did not breakdown further out of pocket expenses, but they invariably stand for public transport tickets and meals. Look Ma, I've been interviewed by The Setup, a popular blog with "interviews asking people from all walks of life what they use to get the job done"; so I now sport a fancy http://stefano.zacchiroli.usesthis.com too. While there is overlap with my previous take on my setup, the questions are different so most of the content is novel. In particular, I quite enjoyed the question about what would be my "dream setup", and indulged in free software/hardware desiderata. Many thanks to Daniel Bogan for running the blog and kudos for his editing work: while it's just a detail, such an abundance and quality of link titles is not easy to come by on the Web. Le Monde: Que devrait être une politique de gauche? Une régulation du capitalisme ou une politique de rupture radicale avec ce système économique? I'm glad to announce that I've been awarded a 5,000 USD "Flash Grant" by the Shuttleworth Foundation. Flash grants are an interesting funding model, which I've just learned about. You don't need to apply for them. Rather, you get nominated by current fellows, and then selected and approached by the foundation for funding. The grant amount is smaller than actual fellowships, but it comes with very few strings attached: furthering open knowledge (which is the foundation's core mission) and being transparent about how you use the money. I'm lucky enough to already have a full-time job to pay my bills, and I do my Free Software activism mostly in my spare time. So I plan to use the money not to pay my bills, but rather to boost the parts of my Free Software activities that could benefit from some funding. I don't have a fully detailed budget yet but, tentatively: some money will go to fund Debsources development (by others), some into promoting my thoughts on the dark ages of Free Software, and maybe some into helping the upcoming release of Debian. I'll provide a public report at the end of the funding period (~6 months from now). I'd like to thank the Shuttleworth Foundation for the grant and foundation's fellow Jonas Öberg for making this possible. I'm honored by the nominations and I thank the fellow developers that have thrown my name in the hat. But I've respectfully declined the nomination. Given my current involvement in an ongoing attempt to introduce a maximum term limit for CTTE membership, it would have been highly inappropriate for me to accept the nomination at this time. I have no doubt that the current CTTE and the DPL will fill the empty seats with worthy project members. See the archives for previous posts.